AFRICANGLOBE – The Iranian Navy Commander Rear Admiral Habibollah Sayyari voiced Iran’s enthusiasm for stronger naval cooperation with Sudan and announced that his forces are prepared to train Sudanese naval forces. The Iranian military official made these statements on Thursday after a meeting with the commander of Sudanese Navy, General Dalil al-Daw Mohamed Fadal-Allah who is on a visit to Teheran. Sayyari, who spoke upon receiving his Sudanese counterpart on Thursday, also said that unity between the two countries’ forces will be effective in confronting their common enemies. 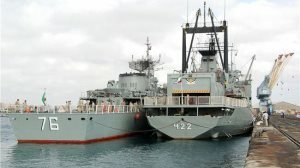 The Iranian news agency Fars quoted Sayyari as saying that the strategic location of Iran in the Persian Gulf, Strait of Hormuz, and northern Indian Ocean and the strategic location of Sudan in the Red Sea and the Strait of Bab Al-Mandeb, would enable the two countries to build close relationships to secure the region. Sayyari further noted the two visits of the Iranian warships to Port Sudan last year pointing out that his country plan to conduct similar docking in the future. Fadal-Allah for his part, called for the transfer of Iran’s naval experience to his country in a bid to protect the security of the Red Sea. He disclosed that Iran agreed to provide the Sudanese Navy with military equipment to secure its coastlines but did not elaborate. Iranian warships, which regularly patrol the Red Sea, docked in October and December 2012 in Port Sudan. The first visit took place days after the bombing of a weapons factory in Khartoum. Sudanese officials at the time accused Israel of conducting the airstrike. The docking of the Iranian warships, however, was criticised by the Arab press and the Sudanese opposition. Reacting to this visit, the Sudanese opposition considered the Iranian-Sudanese military cooperation a threat to Sudan’s relations with the international community, Washington, and the Arab gulf countries. The media spokesperson for the Sudanese government recognized opposition, Kamal Omer, said that the move represents a threat to Sudan’s foreign relations and stressed that it undermines any possible rapprochement with the international community and the United States. “Khartoum is placing itself into the brink of the abyss”, he added. Next articleDid CIA Kill Malcolm X’s Grandson Malcolm Shabazz?